If we look at money, pure as the reward for every hour of labor, the ever-decreasing value doesn't make money suitable for the job. Especially now they make such a mess of hour currency by printing money out of blue air. We should get rid of the system! "Money makes the world go round", that is at least what they say. I think it is labor what the world makes go round and money is only the tool to store the fruits of the labor being done. When you can't trust the storage method however, you need to find a different way of doing so. This is why you can't solve many problems with money! 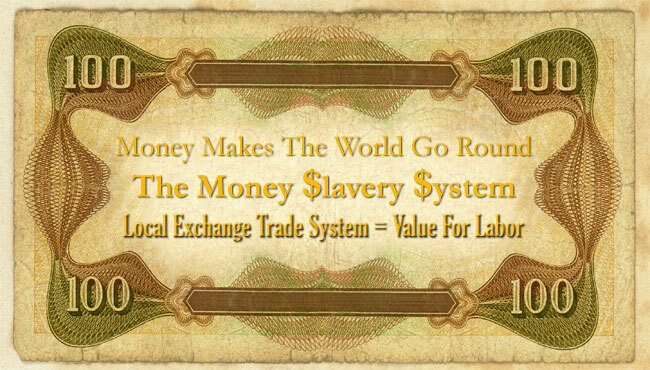 Money was the killer of effective local trading systems. The modern money system is very complicated and did hand over the power behind it to those who are in control of the system. Local trade and small to large projects don't get the chance to develop because of the lack of money. Initiatives like local biological produced food and the honest partitioning of the rich natural sources of nature like free energy don't stand a chance with the old money system. The world is in nature inexhaustible but those in control over the resources wants you to think different about it; they want to charge you for everything! You can put it this way; the money system has turned all of us into modern slaves. With other words; If you can find or participate in a different system to exchange goods and services with a fixed value without inflation, why don't you do it? A way of doing so is the LETS, the Local Exchange Trading System. The question is; What right has a government to have full control over the way we trade our time? Another question; Are the services the government give us for the money we pay them (tax) come close to what we need? Why should we still pay these taxes if they over and over again use it for things we don't want and they promise to do better time and time again? Think again: A shortage of money makes that the growth of our local economy is blocked. A local economic obstacle means that the total world economy is in the hands of others instead of those who are doing the labor. Total control! Talking about it, do you really think that anybody in the world would be paying people the kinds of money they receive now like 100.000 euro / dollar – or more ! How much real –labor - value would they have to deliver for an hour? We have been giving away our value, our labor, the fruits of our work so others could create power and fortune for themselves. This system has gone totally out of control and a collapse of it would benefit us more then go on, and being cheated over and over again! You can however start right now by doing more and more things your own way. Think of this; why should you go out working and trading your time for money and pay lots of tax on food that offers little or no quality to met our demands? Why don't you produce your own biological quality food instead? Question; who gives them control? If I use the LETS system who is in control? You and I! Making a trade only means, I give you something and you give me something is return. If the two parts don't match in value we can trade with LETS points. If I don't have points at the moment, it means that I have to do some type of labor for somebody in the organization. With other words, I'm in dept! But do I have to pay rent? No! And that's a huge difference. Nobody in the organization or the system can make a fortune over my dept or can find any power to gain control over me! See the video and start thinking how you want to shape your future and get back in the control seat! 1). How many value have I for others? 2). What can I contribute to our society? 3). With 1 and 2 in mind, will I be out of a job ... ever? 4). If you know that people over 65 do all kind of useful jobs like babysitting, gardening, small repair work, you name it. Do they need a pension or do they still have value in the LETS system? 5). If we work for sick and disabled people and being paid with LETS points, do we need to pay tax?